This Walton's Contemporary Garden Room is striking summerhouse with a 1950's styling. 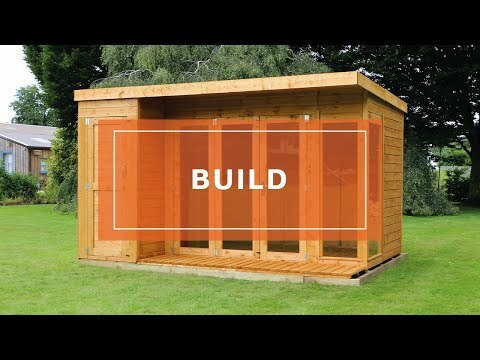 It includes a side shed to keep your garden tidy too! This stylish, 10ft x 8ft Contemporary Summerhouse, is a contemporary twist on a 1950's style building. It will certainly add something to its surroundings, no matter where that might be. The fully glazed concertina opening doors gives you an inhibited view of your garden and comes with high grade stainless steel lock and key. Its doors open fully to 170cm, making it easy to move furniture in or out and allow plenty of air in during the warmer months. 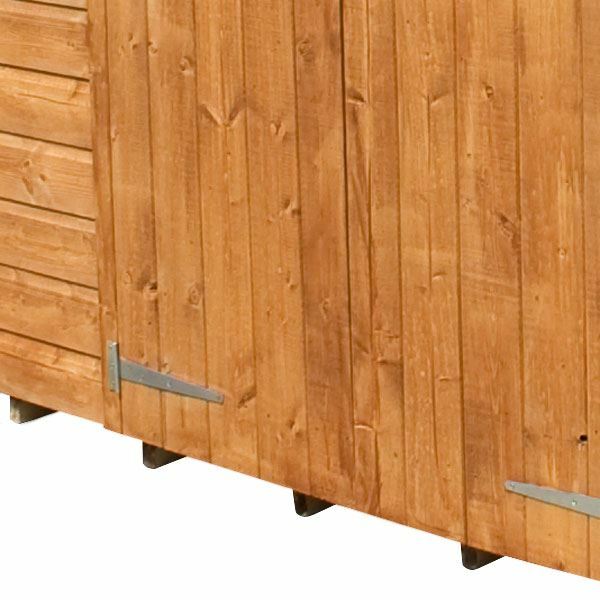 The building is fully manufactured in the UK and made with sturdy and traditional British 12mm shiplap tongue and groove cladding. The cladding itself is machined with a shiplap profile to aid water dispersion and enhance the longevity of the building. To ensure its stability, the easy to assemble pre constructed panels are supported by 27mm x 44mm rounded edged framing. This is considered to be a strong gauge of timber for a summerhouse of this type. This contemporary summerhouse also benefits from using only planed timber, to not only give a superior and even finish, but this process also closes the pores of the timber. This makes it much more resistant to moisture and will help to extend the life of the building. The side shed of this building is modular and can be constructed on either side of the main summerhouse room. 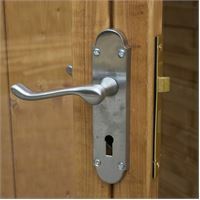 A Chrome plated door handle with lock and key are provdied with this building. The traditional looking finish to a floor which is strong and durable. Fantastic to hear you're so pleased with your finished summerhouse. 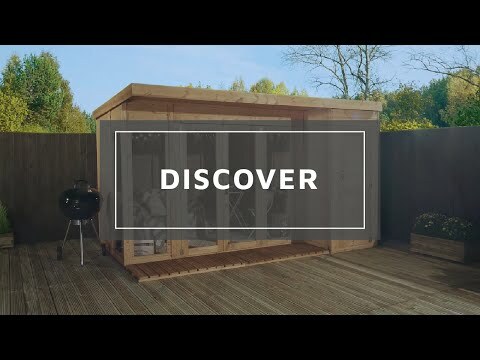 Review:It is a well designed and nice looking summer house but the instructions are confusing/ just plain wrong in places. Also some of the screws are not the right length and we had to go and buy a few longer ones. I was also left over with a whole bag of brass screws which weren't needed?! Review:Well made/easy to put together/looks great. Thank you for your feedback, I am thrilled to know that you're pleased with the Summerhouse and that the assembly process was straightforward. Thank you for your review, it's great to know that you're pleased with the product and that you have many happy memories in your Summerhouse. Thank you very much for your brilliant feedback! Review:It's not built yet but it seems OK. I can see there's a scratch along the length of one of the floor panel but it's the bit in the side shed so it won't really matter. Review:Great quality , great service ! It is wonderful that you are happy with both the service and quality of your summerhouse and I am sure you will have many happy years of use from it.Thank you again for your great review. Review:Instructions were very good. The item itself went together well and is very sturdy. I am pleased that assembly was straight forward and you found the instructions to be very good. I am also glad that you are happy with the quality of your summerhouse and we thank you again for your great feedback! I am delighted to know that you are very pleased with the quality of your summerhouse and that you would highly recommend Waltons. Thank you very much for your fantastic review! Thank you very much for your feedback, I hope you enjoy your new summerhouse for many years to come. Review:Just built it, so unable to comment fully. It mat be an idea to number the different components in the factory prior to delivery. Sure it would save a few arguments! Review:lovely summerhouse, it said needs two to put up, I managed on my own,.. just !! looks lovely up now just needs some furniture. Our Reply:It is wonderful to know that you are really happy with your summerhouse and assembly went well. Review:Excellent quality for the price. Having painted it looks far more expensive than it cost and we have lots of positive comments from others. Our daughter loves the summer house which has become her playhouse and plenty of storage for us in the shed. 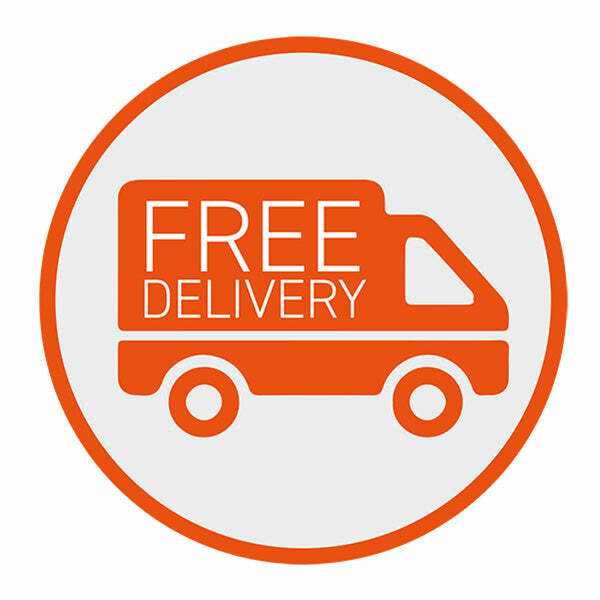 Our Reply:So great to know you feel your summerhouse is excellent quality for the price paid and that this has resulted in high customer satisfaction. Thank you again for your feedback.